KEEP UP TO DATE WITH OUR SCHOOL BY CHECKING OUR NEW WEBSITE! Book classes, buy Capoeira items and find classes near you! This year Professor Marcus Cabeça and his students will be once again taking part in the Kingston Carnival parade! Kingston Carnival will be taking place THIS SUNDAY September 3rd from 12pm. Kingston Carnival is a celebration of the cultural diversity of the borough of Kingston upon Thames. The procession starts at midday from the Guildhall with spectacular costumes and wonderful groups showcasing local communities music, culture and food. The carnival events take place in the Market Place, High St, Memorial Gardens, All Saints Church and the Rose Theatre. This is a great family day out so come and soak up the atmosphere! AGED 12-25? INTERESTED IN LEARNING CAPOEIRA? Sign up for our FreeSport scheme today and receive 8 FREE CLASSES OF CAPOEIRA! FreeSport is sponsored by the Mayor of London and Coca Cola Zero. Classes Wednesdays & Fridays 7.30pm-9.30pm at Reynolds Sports Centre, Acton High School, Gunnersbury Lane, London W3 8EY. Recently Professor Marcus Cabeca has been working with Sky to bring a taste of Brazilian culture to their 3000 staff members through his ‪#‎Capoeira‬ classes. Professor Marcus Cabeca's school is now a member of London Youth - A network of diverse youth organisations that serve young people from all backgrounds with the aim of helping young Londoners grow up healthy, navigate a fulfilling career and make a positive contribution in their communities. Huge thanks to Mestre Big Dinho, Mestre Cobra Mansa, Mestre Catitu, Mestre Poncianinho, Mestre Parente and all our guests for making our 10th Anniversary an amazing and memorable experience! Martial Arts, Music, Dance - Professor Marcus Cabeca’s Capoeira School has lots of activities to keep your child engaged! Click HERE to for information about our Kid's classes. 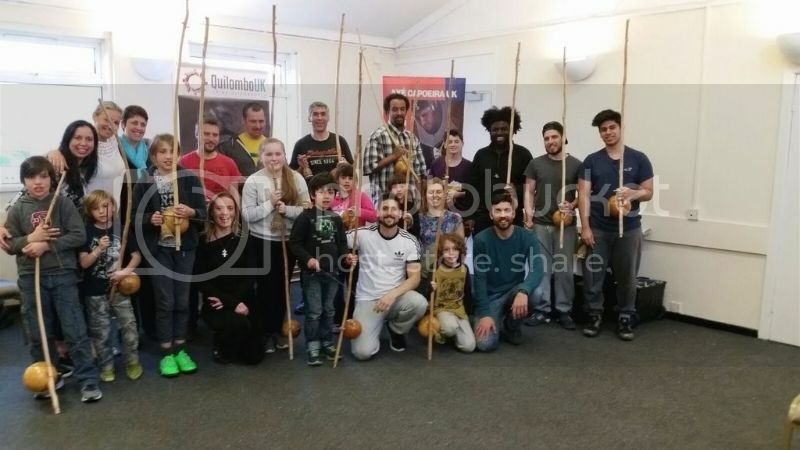 Last weekend Professor Marcus Cabeca & students took part in a 'Make Your Own Berimbau' workshop. The workshop, run my Professor Marcus Cabeca, gives students the opportunity to build their own Berimbau and learn some of its basic rhythms. Congratulations to all students who took part in Professor Marcus Cabeca's 'Make Your Own Berimbau' Workshop 2016! Another year, another set of new Berimbaus! Check out the MYOB gallery to see more! Professor Marcus Cabeca is to feature in an upcoming episode of Richard Hammond's 'Science Of Stupid' on the National Geographic Channel. Using science, Richard Hammond explains the physics, chemistry and biology behind a variety of spectacular stunts and unfortunate mishaps. Make sure you're on the lookout for the upcoming episode! The Ealing Times recently spoke to Professor Marcus Cabeca to learn more about Capoeira!